One of the first tiffs I had with my boyfriend was when I got offended when he said I was crunchy. I argued, "I don't like granola. I shave my arm pits. I LOVE white bread!" While I have relented that I am probably at least a little bit crunchy, I do still really prefer a good, crusty white loaf to whole wheat. There's something about its quintessential breadiness; the way that you can eat it with anything. So when said boyfriend suggested I make a whole grain loaf, it took me a while to actually try it out. After much experimentation (sorry to all my friends on whom I tested not so awesome recipes), I think I've arrived at a very yummy version of a whole grain no-knead bread recipe. I invite you to make the recipe as is, or to play around with it yourself. The trick is always to have enough white flour to compensate for the really heavy dense stuff you put in it. I've read that the maximum you'd ever want whole to white would be 1:1. Otherwise, the bread ends up way too dense (and stone like). I'm pretty happy with a 1:2 ratio. While I often buy flour which is milled nearby in New England (like King Arthur), they actually get their grains from places like Kansas or North Dakota, which are not local by any stretch of the imagination. I am willing to make this sacrifice because I do love the wheaty carbohydrate foods like pasta, bread, and pizza. So instead, I'm committed to buying in bulk and making it myself whenever possible. 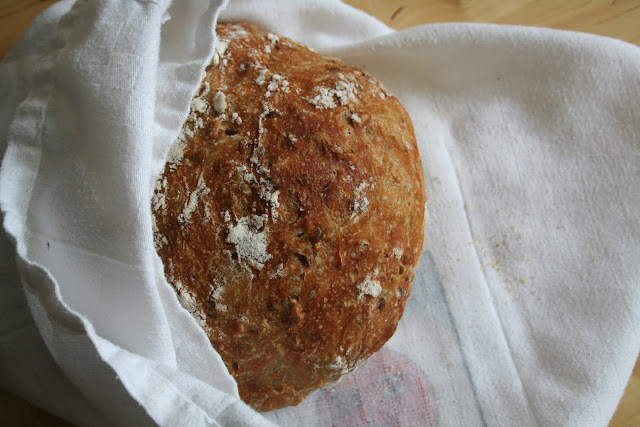 The good news, for those of you equally addicted to bready food, is that this no-knead recipe is extremely easy. The only hard part is that it takes time (not effort, just time). 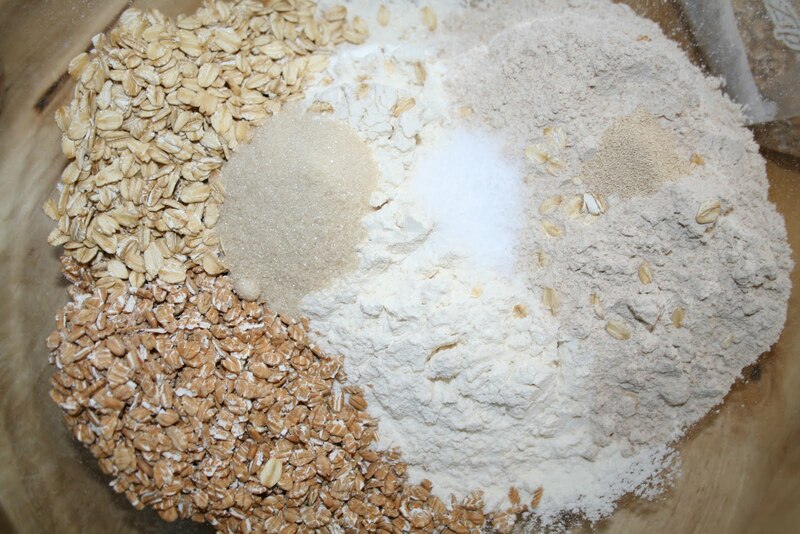 Mix the rest of the dry ingredients in a large, non-reactive bowl. I'm a huge fan of the Pyrex mixing bowl set with lids. When making breads and pasta, this basically eliminates the need to cover in disposable plastic wrap (yay!). Add the water and the roasted seeds and stir till mixed thoroughly, about a minute. You will end up with what they call a "shaggy" dough that is wet and sticky. This recipe calls for more water than a typical kneaded dough. 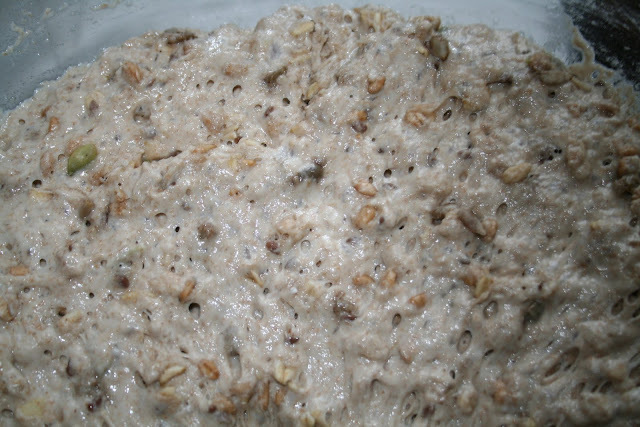 You're basically providing enough food and water (and time) for the yeast to do all the work through fermentation that you would have to do by kneading, namely allow the gluten molecules to bond to each other, creating the elasticity to hold the shape as the yeast releases air in baking. Then comes the easy part - cover and wait. And wait a little more. In total, you should let it rise at room temperature for at least 14 hours or even longer if you have the time. I typically make the dough the night before I want my first loaf. The dough will have settled into the full shape of it's container (rather than the ball you left it in) and should be dotted with bubbles. You can cook it all at once or you can take a quarter or a half or whatever amount you need. The rest of the dough you can store in the refrigerator till you need it. One quarter will give you about 2-3 servings. Unless you're feeding a small army, you should only cook a small amount at a time. 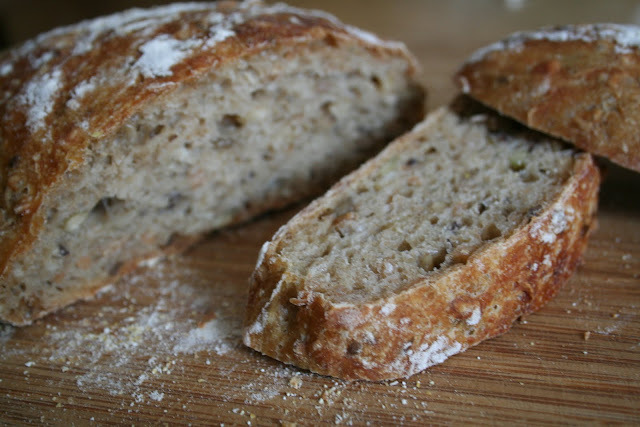 The whole grains are really awesome at holding in water, so you end up with really moist bread. But you can also end up with a mold time bomb if you don't eat it within a few days. No matter when you use it, the bread turns out great, although I will admit that it tends to be lighter when made without refrigeration. Whatever portion size you've chosen, plop it on a floured wooden surface. I give it a few good kneads, but all you really need to do is flop it over on itself a few times picking up some of the flour. 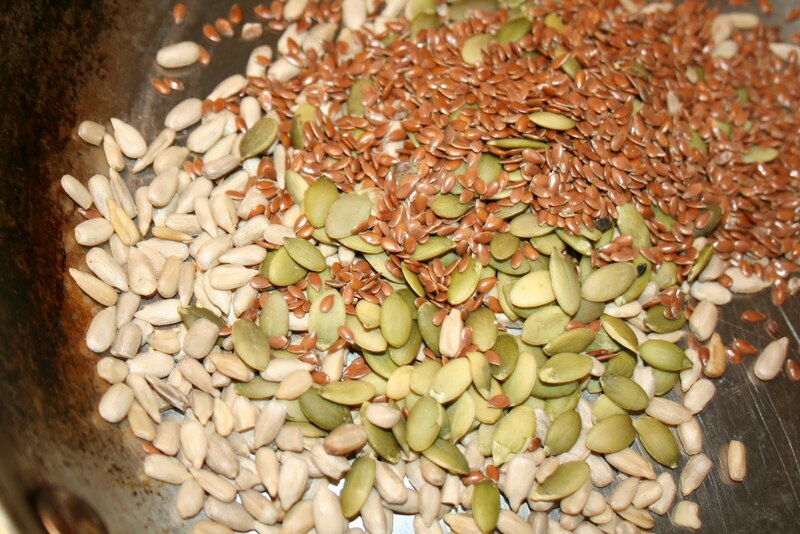 (If you want to add nuts or dried fruit, do so at this time.) Cover with a smaller Pyrex bowl (should be big enough to allow the dough to double in size) for fifteen minutes. Generously dust the inside of the bowl with flour. 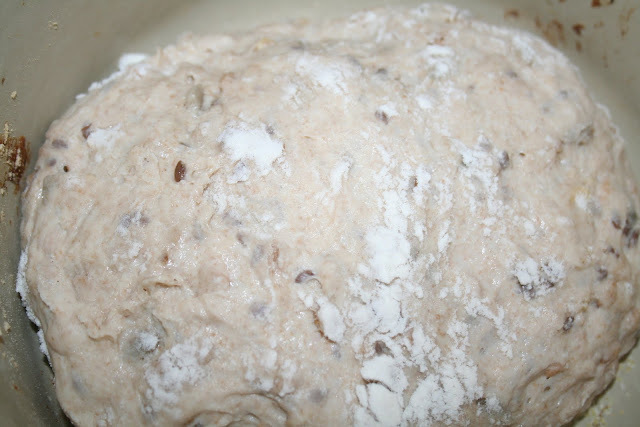 Form the dough into a ball and place into the bowl. Cover and let rise for at least two hours. 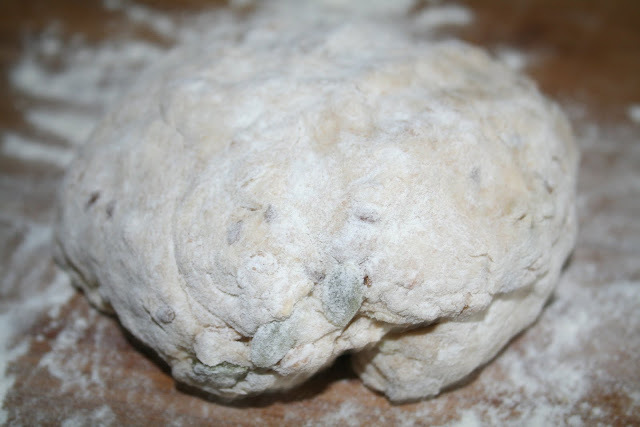 If you're taking dough from the fridge to use, follow the same steps as above, but then tweak the second rise. If you want bread for dinner, take dough out in the morning and let it rise all day. If you need it more quickly you can use a proofing box or preheat your oven to 100 F for about five minutes and place the covered bowl inside with the door ajar. Don't allow the oven to get too hot. You don't want the dough to be above 90 F or it will kill all the yeast. This method will shorten the rising time to just shy of two hours. About a half hour before the second rise is finished, preheat the oven to 475 F with a Dutch oven warming inside. To get a gorgeous crusty crust, you will need a covered cooking dish to hold the water in. I've found a Dutch oven works best. If you're cooking the entire thing you'll need at least a 6 quart Dutch oven. Scale down accordingly for other portions. Other methods include cooking on a pizza stone with a pan of water below it. Also, spraying the loaf with water 3-5 times during the first ten minutes of cooking. To get the dough into the cooking device, dust the top of the dough with flour and then flip the bowl over your hand. 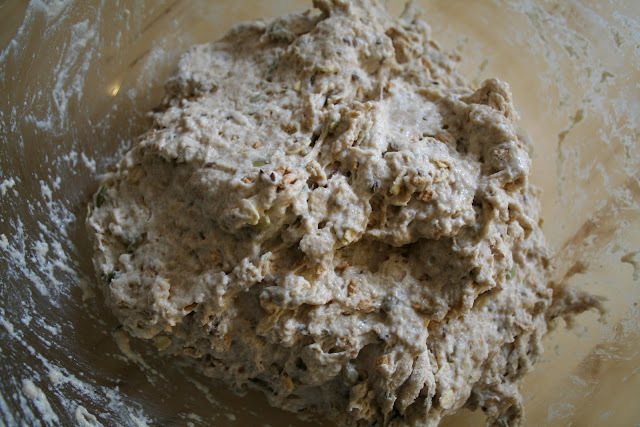 Gently coax the dough out and quickly transfer it to the cooking device. Cover and place in the oven. Start checking the bread around 15-20 minutes in. Once a nice crust has developed, take the top off and allow it to cook 15-20 minutes more. Cool on a rack and then enjoy alone or with butter, goat cheese, or jam.